Being a girl can be tough – between social media, TV, and movies, girls are often pressured to grow up too fast. 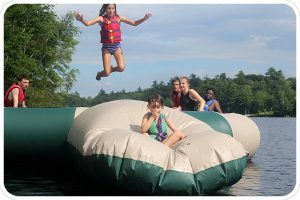 Here at Quinebarge in Moultonborough, New Hampshire, our campers unplug and spend their time just being kids. Our program focuses on friendships and fun – girls spend their days playing, learning, and achieving, ultimately growing their confidence while letting them simply enjoy their youth. At Quinebarge, girls are unconstrained by the dynamics of home and school; the clean slate allows them simply to be themselves. Our staff are specially trained to coach and encourage campers to be their best. Girls work with counselors and their peers to try new things and achieve their goals. 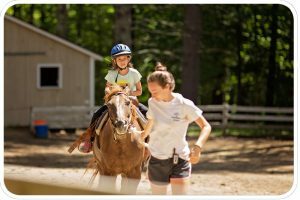 Whether it’s getting over a 10 foot wall, trotting on a horse for the first time, or conquering our High Ropes course, girls are taught that they can do anything if they set their minds to it and believe in themselves. Just being responsible for themselves, doing simple cabin chores like sweeping or taking out the garbage, making new friends, learning new sports, creating something in woodshop or helping care for rabbits or chickens in the Nature shed are often new accomplishments and make kids feel more confident when they are home. Our diverse program has activities for everyone! For girls with artistic flair: Arts & Crafts, Woodshop, and Ceramics. Athletes enjoy Sports, Swimming, Boating, Adventure, and our Trips Program. Animal lovers love Horseback Riding and Nature. 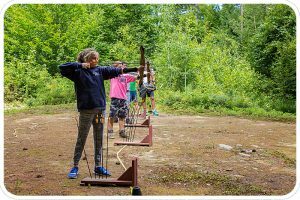 But according to our girls, the best part is that you don’t have to fit into just one category – choosing activities allows each girl to be herself. 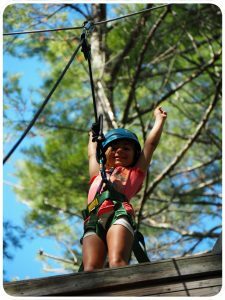 Our girls area is divided into cabins for each age group. With all the excitement of daily activities, kids enjoy coming back to their cabins for formal and informal bonding time. Our skilled counselors lead cabin games, (LED) Candle Pass (nightly in-cabin chats), and other cabin activities. Girls also hang out, play games, and try to push lights-out by quietly reading and chatting. 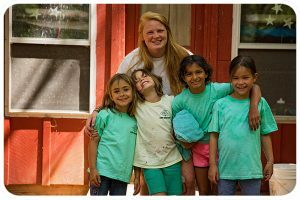 The girls love this time to build their camp support systems with friendships that often last far beyond summer. Quinebarge went coed in 1975, and ever since, boys and girls are together during activities, meals, trips, and other aspects of our program. We believe in fostering friendships and teamwork between boys and girls and across age groups, building person-to-person skills to last a lifetime. More importantly, our girls tell us they love the ability to build friendships with any Quinebarger – regardless of gender. Girls will find that Quinebarge is a place to grow, explore, and make everlasting friendships.